Wedding Cakes Glasgow, Lanarkshire, Gretna and Central Scotland. You Deserve The Wedding Cake of your DREAMS! 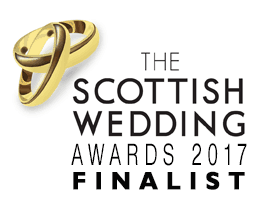 We provide award-winning Wedding Cakes in Glasgow, Lanarkshire, Gretna, Ayrshire and most of Scotland. Most couples meet us at our bakery for a free cake tasting and design consultation- we also have a range of ready to order wedding cakes available to personalise and order on this website. Cutting your Wedding Cake- that iconic photo! We know how important and symbolic your wedding cake will be for you on your wedding day. The cake is one of your wedding’s big focal points- Just imagine standing together, beside your cake, with all your family and friends taking a photo of you, like the nicest paparazzi ever! You can then enjoy your delicious hand-made wedding cake after your wedding meal, with your ‘cutting the cake’ photos in your wedding album to look back on! Each wedding cake we make is truly special at Jenny’s Cakes, so it’s a real thrill when clients take the time to send us a ‘Cutting The Cake’ photo. We take pride in our work, and love to see the end result of our baking, assembling and decorating efforts. (The photo here shows Adriana and Ricardo cutting their Five Tier ‘Baroque Cream Rose wedding cake’ at Mount Stuart on the Isle of Bute). 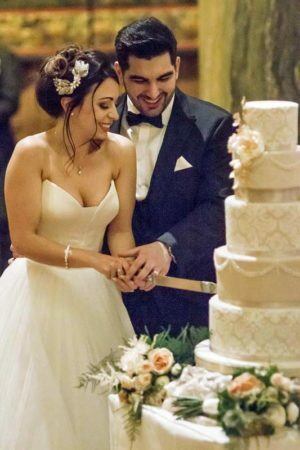 We LOVE a great Cutting The Cake' Photo. Our Professional Wedding Cake Bakery in Lanarkshire. We LOVE our work- we are dedicated to making each Wedding Cake truly special. At Jenny’s Cakes, each cake is made by hand with love and dedication, always with attention to detail. 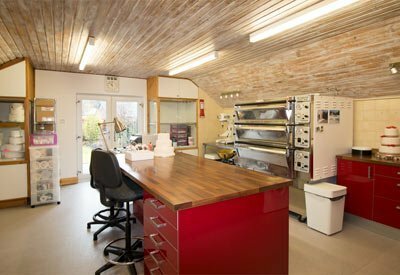 We are proud of our professional bakery set-up, a carefully designed creative environment, where our team have everything they need to make your wedding cake to the highest possible standards, from baking to assembly, adding those all important decorative touches and details that mean so much to our couples. Come and meet us for Tea and Cake! 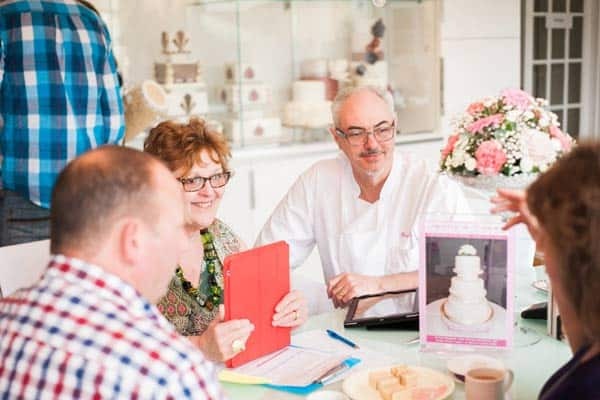 Choosing a cake for your wedding sometimes needs a bit of support- this is where Jenny and Tom can bring their experience to help you. We love discussing the details of your big day, over a cuppa and some tasty cake samples. Between us, we have over 60 years experience, having created thousands of beautiful wedding cakes over our 32 year history. The design and style of the bridal gown can give us a good starting point. Other elements such as bridesmaids dresses, floral bouquet, the wedding venue, how the tables and chairs and the function room itself is dressed, the number of guests, and of course budget are also taken into consideration. We can help you put your ideas on paper and create a unique wedding cake design sketch just for you, with all your personal touches added. We LOVE meeting Couples for Wedding Cake Consultations. The Wedding Cake- we understand how difficult it can be for you to choose the best design for your Wedding Cake. So many different Wedding Cake styles to choose from- where to start? How many tiers do we need? Shapes– round, square, stacked, pillars, separators, cake stands? Wedding Cake Decoration– ruffles, marbling, pearlising, sugar flowers, gilding, lace, thistles, ribbons! Cake Flavours– Do we need fruit cake? Can we have different sponge flavours? When and how to book? How do you find the best wedding cake bakery for your particular needs? Jenny's Cakes would LOVE to help you! At our Artisan Wedding Cake Bakery, located in South Lanarkshire, we have a small bakery team dedicated to making each wedding cake truly special. Read more About our Team here. We have over SIX decades of experience in creating beautiful wedding cakes. A small family business started in 1986, we limit our workload to allow time for us to make each wedding cake to order, adding the small details to build the personal touch into each cake we make. 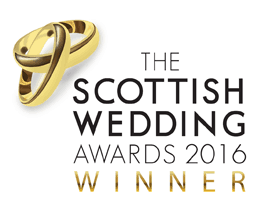 We are proud to be multi-award winning bakers of hand-made wedding cakes. We would love to help you to make the best choice for your wedding cake, so why not take the first step by sending us some initial details and we can check out our availability for your big day! If you are at the early stages of your wedding plans, why not request a copy of our FREE Report – 6 Secrets you need to know to choose your Ideal Wedding Cake!